Mix together cream cheese, onions & chicken broth to create a yummy Creamy Pasta Alfredo. 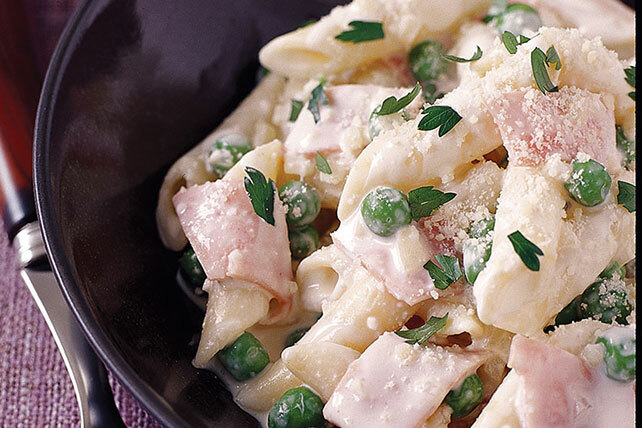 This Creamy Pasta Alfredo is a dish the whole family will enjoy. Spray large skillet with cooking spray. Add onion; cook 5 min. on medium-high heat until tender. Add cream cheese and broth to skillet. Bring to boil, stirring to mix ingredients. Add peas, ham and 2 Tbsp. of the Parmesan cheese. Keep warm. Meanwhile, cook mostaccioli as directed on package; drain. Toss hot mostaccioli with cream cheese mixture. Sprinkle with remaining 1 Tbsp. Parmesan cheese and parsley. Serve immediately. Use a large pot of water to cook pasta so it has room to move and won't stick together. Do not rinse the pasta or the sauce will slide off. Toss hot pasta immediately with sauce for great coverage.